90% & 40% US Silver Coins. 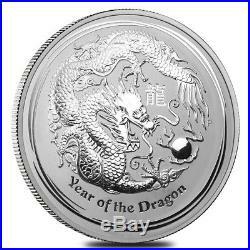 2012 1 Kilo Silver Lunar Year of The Dragon BU Australian Perth Mint In Cap. Bullion Exchanges is thrilled to offer you this stunning 2012 1 Kilo Silver Lunar Year of The Dragon Coin. The Lunar Series is based on the ancient 12-year Chinese lunar calendar and depicts a different animal every year, starting with the mouse in 2008. This coin is struck from. 999 pure silver and has a high demand on the market. Produced by one of the most prestigious mints in the world, carrying the newest image of the dragon, this beautiful coin is a treasured addition to any portfolio. 999 fine silver, individual weight of 1 kilo. Minted by the Australian Perth Mint. Each coin comes in a plastic capsule. Coin comes with "P" mintmark. Sovereign coin backed by the Australian government. Obverse: Showcases the effigy of Her Majesty Queen Elizabeth II, designed by Rank-Broadley. 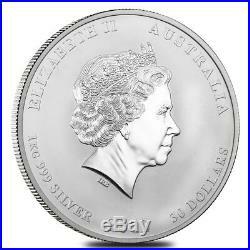 Inscriptions: "Elizabeth II", "Australia", "30 Dollars", "1 kg", . 999 Silver" "2012", "30 Dollars. Reverse: Features a traditional Chinese dragon as a long, serpentine creature with four legs with a "Pearl of Wisdom" and the Chinese character for Dragon. " Inscriptions: "Year of the Dragon. Add this superb coin to your collection today, and it will be carefully wrapped, packaged, and safely delivered to your address. Get this 2012 1 Kilo Silver Lunar Year of The Dragon Coin today. By purchasing from Bullion Exchanges, you are agreeing to all of our Terms and Policies. Bullion Exchanges reserves the right to refuse or cancel any order reviewed by our Compliance Team, which are deemed questionable or have increasing potential risk for being fraudulent. All customers are subject to a review at our own discretion, in which additional information, identification and/or documentation, may be requested. Please keep in mind, the appearance of the toning and/or milk spots does not mean that the coin is not the grade specified on the actual slab. In instances where there is a discrepancy where the customer believes to be unjust, please refer to the grading companys guarantee policy. Both NGC and PCGS have a program where they will compensate the owner of the current coin if they believe the coin deserves a lower grade than it had originally received. Please note, bullion coins, bars and rounds are mass-produced and are not struck to the same quality standards as collector coins. These bullion products are not certified and therefore will not always be 100% perfect. All sales are final and therefore in cases when a product is offered on a Deal Price, previously locked-in orders for that product will not be subject to price reductions or cancellations. Bullion Exchanges reserves the right to cancel sales that may or may not have typography issues within the listings, pricing inaccuracies, systematic faults by our system, and/or errors caused by eBays system, without further notice. Purchasing bullion and/or coins involves price risk, and the purchaser assumes all such risk. We do not offer or make price adjustments based on the market fluctuations of precious metals, or for any other reason. We will never ask the customer to pay more for a product if the price significantly increased, so please refrain from requesting price adjustments after market prices decrease. The item "2012 1 Kilo Silver Lunar Year of The Dragon BU Australian Perth Mint In Cap" is in sale since Wednesday, February 6, 2019. This item is in the category "Coins & Paper Money\Bullion\Silver\Coins".exchanges" and is located in New York, New York. This item can be shipped to United States.